One of the nephews is obsessed.obsessed with the Lorax. He has read the book almost a hundred million times and went and critiqued the movie for accuracy, bearing in mind he just turned 3. 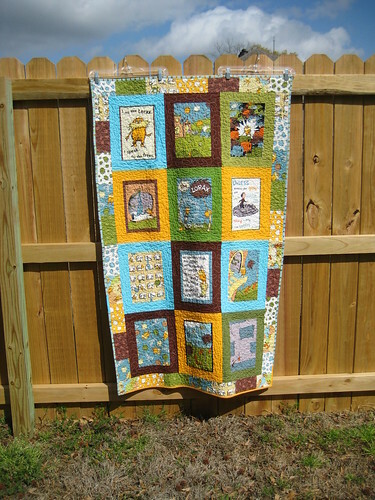 And since Robert Kaufman keeps releasing adorable, like I think I died a little, Dr. Seuss fabrics, I knew he needed a Lorax quilt for his birthday. 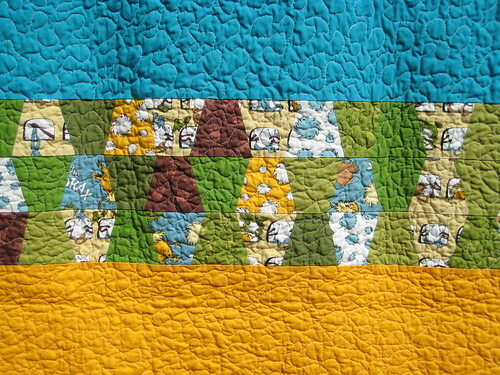 This quilt came together quickly with a panel of 10 images from the book, I presume, and 9 fat quarters of the supporting prints. I saved one of the fat quarters for the binding and supplementing with solids when I ran out. I also did this cute tumbler design on the back to break up the solids. With my GoBaby! cutter it was ridiculously easy to line them all up. 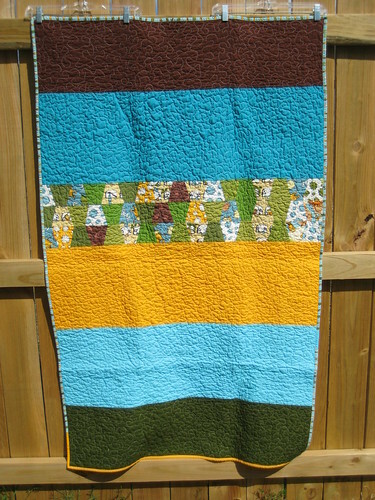 Fabric: The Lorax by Robert Kaufman, Kona Papaya, Kona Bahama Blue, Kona Chocolate, and various Kona greens. I love this! I bought the panel quite awhile ago but haven't done anything with it since I didn't like the pattern that was at the quilt shop. I am sure the nephew will love it. Can you tell me how wide of strips you used to border each of the 'pages'? Well I have been looking all week for my notes from this quilt and it has proven unsuccessful. From what I can remember, the borders are probably 2.5 inches cut and the border bricks are probably 3"x6" cut.